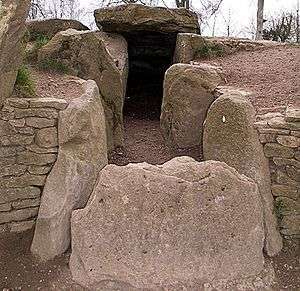 A Severn-Cotswold tomb (or Cotswold-Severn tomb) is a type of megalithic chamber tomb built by Neolithic people in Wales and South West England around 3500 BC. Severn-Cotswold tombs consist of long, precisely built trapezoidal earth mounds covering burial chambers. Because of this they are a type of chambered long barrow. In some examples, pairs of smaller burial chambers lead off from either side of the central rectangular burial chamber, itself connected to an ante-room. In others the entrance is a false entrance, with the burial chambers accessed laterally from directly outside. A third group have merely a single large chamber. Examples include Wayland's Smithy in Oxfordshire; West Kennet Long Barrow near Avebury, Wiltshire; Hetty Pegler's Tump, near Uley, Gloucestershire; and Belas Knap, near Winchcombe, Gloucestershire. In Somerset examples include Stoney Littleton Long Barrow and the Fairy Toot. Wayland's Smithy is on the Berkshire Downs and was excavated between 1962 and 1963, at which point it became obvious there were two successive barrows on the site. ↑ Lynch, Frances (2004). Megalithic Tombs and Long Barrows in Britain. Princes Risborough: Shire. p. 54. ISBN 0-7478-0341-2. Retrieved 20 April 2011. ↑ Dunn, Richard (2004). Nempnett Thrubwell:Barrows, Names and Manors. Nempnett Books. pp. 33–62. ISBN 0-9548614-0-X. ↑ Atkinson, R.J.C (1965). "Wayland's Smithy". Antiquity. 34.